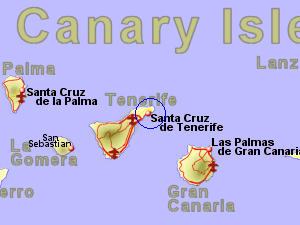 The weather data for Tenerife comes from the capital, Santa Cruz, on the north east coast of the island. Tenerife has warm winters due to being only half the distance from the equator compared to the UK yet the summers do not get much hotter, due to the cooling effect of the Trade Winds bringing cooler air down from the north and the cooling effects of the Atlantic Ocean, similar to the other Canary Islands. Occasionally in the summer than can be an easterly wind, lasting a few days, bringing hotter in from Africa. Any rain that falls on the island of Tenerife is confined mainly to the north, having been carried in on northerly winds which then hit the higher ground in the centre of the island (which rises to 3,700m or just over 12,000ft - the highest Spanish ground). Santa Cruz has a total of around 11 inches or 280mm of rain per year, practically all falling from October to June.